So I’ve fallen in love with a magazine called Womens Fitness. It’s totally inspirational on every level (and only $6.50) but it’s the recipes that are by far the most amazing! 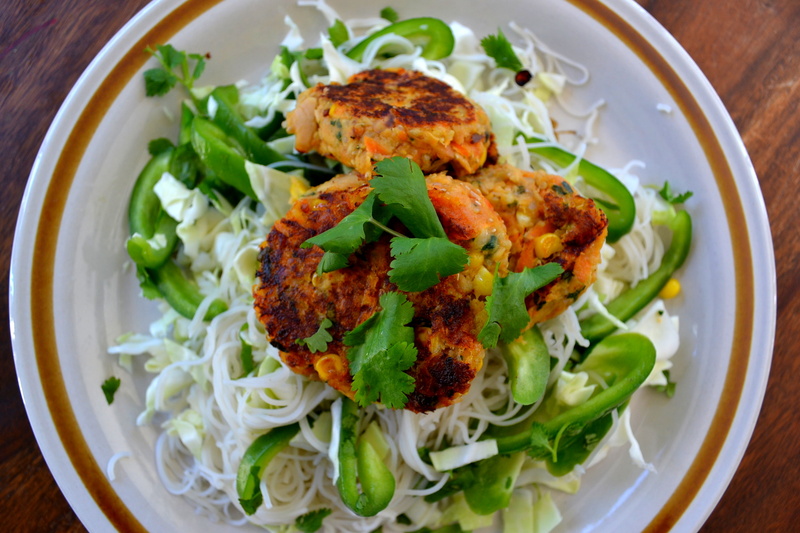 Today’s lunch was Tuna and Sweet Potato Patties with green capsicum, cabbage and rice noodles. And the best bit is you can make a batch, (big ones for me and little ones for the boys) freeze uncooked in ziplock bags, defrost, pop in the frypan and add to any fresh goodness you have in the fridge. I made a few changes to the recipe (as you do). Mostly because I’d run out of eggs and my amazing sister who’s totally my go-to-girl for ingredient substitutes told me that when you’re using eggs to bind you can use 1tbs tahini or peanut butter for each egg it was replacing. I tried it and loved the flavour so much I have kept doing it. Squeeze out excess liquid from grated vegetables. Transfer to a bowl and add quinoa, tuna, tahini/ peanut butter, corn, sweet potato, garlic, chia seeds and spinach, season with salt and pepper and mix well. Add coconut flour/ rice brown flour if needed. Roll into patties. Heat coconut oil in a pan over medium heat and fry the patties on each side till golden. yum!!! On my list! I never knew that about pb or tahini instead of eggs! !